Because I know I will make a difference in the fight to end ovarian cancer. I know that fundraising by walking and holding bake sales for T.E.A.L. 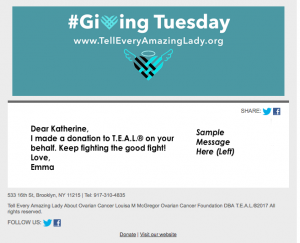 (“Tell Every Amazing Lady”) events I will help save lives from ovarian cancer. I believe that one day ovarian cancer will never steal another year from any woman’s life. T.E.A.L. is not only an opportunity for my community to join the fight against ovarian cancer, but also a way to inspire hope by raising funds and awareness to help those facing the disease. That’s why I’m walking to celebrate more birthdays. My reason for walking in the Tell Every Amazing Lady event is personal – On 8/23/2013, at the young age of 34, and 5 days before my 35th birthday, I was diagnosed with this life-changing disease called Ovarian Cancer. For those who know me know that I am very outgoing and very hard working. This illness took me by storm – taking away a greater portion of my life, but giving me the strength to survive! On 10/29/13, treatment began with a radical hysterectomy. I was blessed in not having to go through chemotherapy or radiation treatment. Thanks to all of my family & friends who supported me throughout this journey, because today, I claim victory over ovarian cancer and I am getting my life back. My team is walking because we’ve been affected by ovarian cancer in some way, and because the T.E.A.L. event gives us the power to make a difference and fight back. This is my opportunity to honor ovarian cancer survivors, remember the women we have lost, and help raise funds for groundbreaking research information and services for people fighting ovarian cancer, as well as help find a way for early detection. It was a coincidence I was diagnosed early but God forbid I had not, I may not have been fortunate enough to see the age of 36. Every day T.E.A.L. helps people take steps to reduce their risk of ovarian cancer or find it early when it is easiest to treat. Today, one out of every three women newly diagnosed with ovarian cancer reaches out to T.E.A.L. for help and support. They provide free information and services when and where women need it throughout their journey to get well. I have signed up to walk and fund-raise with Tell Every Amazing Lady. I hope you will consider joining my team and/or making a donation in support of my efforts. Together we can TELL EVERY AMAZING LADY and end ovarian cancer! My amazing mom Rae Arden Bassini Karlovsky was diagnosed with Stage III Ovarian Cancer in May 2004. She was 53 years old. She had the classic symptoms for months and was misdiagnosed by her doctors. Had her symptoms been recognized earlier, she may have still been with us today. She fought an incredible battle for over 3 years. Surgeries, chemo and countless indignities just to stay alive. She lost her battle to on September 16, 2007 at 56 years old. I miss her every day and think about her every day. There is a gaping hole in my heart and in my life that will never be replaced. I love you mom and miss you. I am the team leader of Rae’s Leopard Divas. We are all walking to honor my mom’s memory this year, 2013. July 12, 2008 was the best day of my life. I married my high school sweetheart, the love of my life. They always say the first year of marriage is the hardest but boy did we prove that right. Just 3 months after my fairytale wedding I was at the supermarket doing my weekly grocery shopping. As I was walking home I thought, “I think I am going to buy a pregnancy test.” By no means did I think I was pregnant but I went to the pharmacy and purchased one anyway. I went home and took the test the whole time thinking it can’t be positive. To my complete shock the test was positive! I was pregnant!!! I couldn’t wait to tell my husband. After a few days I went to see my OB where another test did confirm I was pregnant. I was so excited but my OB wanted a blood test to make sure. When we got the blood test results something wasn’t right. My numbers weren’t high so we just assumed I was going to have a miscarriage. A few days later at another visit I mentioned to my doctor that I had a slight pain on my side. This was a pain that I would never have mentioned but for some reason I felt the need to. At that point he immediately sent me for a sonogram. Well I must say the sonogram was the worst experience of my life. The technician basically made me think I was on the verge of dying and kept scaring me the entire visit. I waited in the office for my OB to call me back where he then told me to go tomorrow for a CAT scan. After my CAT Scan this technician came up to me and kept asking me questions on if I felt any pain or not. From the look on his face and the questions I knew something was wrong! I was told to meet my OB in the office on Monday to discuss my results. I honestly can’t tell you how that appointment went because it is all a blur. All I remember was the words “Ovarian Cancer.” I think I was in such shock that I ended up going back to work because I couldn’t believe they thought I had cancer. I was 25 years old, young people don’t get cancer. After making several appointments with surgeons all they wanted to do was give me a full hysterectomy because they said it was the best way. I was not going to accept the fact that I will never be able to carry children. How could I become infertile as a 25 year old newlywed?? There has to be another answer. I already had accepted the fact that my ovaries were gone and there was no saving them. I just hoped my uterus would be saved. I immediately knew I had to make an appointment at Memorial Sloan Kettering. I remember sitting in the waiting room shocked, nervous and very scared. How could I be sitting in the waiting room at Memorial Sloan Kettering as a patient, I was too young! My surgeon at Sloan didn’t just look at me as an Ovarian Cancer patient but rather a young girl with a full life ahead of her. I knew I could trust him to operate on me. On December 4, 2008 it was finally my surgery day. I remember the surgeon speaking to me before the surgery and told me he would do everything you can to save my uterus. Going into the operating room was one of the scariest moments in my life. The anesthesiologist did everything he could to talk to me and almost make me forget where I was. The first thing I remember post-surgery was the doctor whispering to me that he saved my uterus. At that point I didn’t feel any pain but just pure joy! He took the time to make sure I would have the ability to carry a child. Now fast forward 4 ½ years…On March 11, 2013 I welcomed my beautiful twins Alexa Maria and Nicola Giuseppe. I had a pregnancy with very minor complications and carried them to 38 weeks. I probably would have gone longer but we scheduled a C-section to be on the safe side. When I saw them for the very first time I knew these were my miracle children. When I got diagnosed with Ovarian Cancer I really kissed my chance at motherhood goodbye, but now here I am looking at my children. The reason I am sharing my story is to help all those young Ovarian Cancer and other cancer patients. I know not all are as lucky as me to be able to carry a child but anything is possible. I want to be able to help people overcome the struggle cancer brings you. I never would have thought I would be strong and overcome my cancer, but I was. Even 5 years later cancer is on my mind every single day. Cancer brought me into debt, emotional and physical discomfort. I just hope by sharing my story I can brighten up the day of a fellow survivor or a warrior fighting this horrible disease! my best friend, hero, mother was all ready to walk the walk of a survivor, but exactly three years to the date of her last treatment she begins a new treatment because of reoccurrence. She still plans on walking saturday as a survivor, and i will be walking proudly next to her. Hi my name is Maria, April 2012 I lost my mom she was diagnosed with ovarian cancer October 2009, she went thru chemo and treatments but she lost her battle, she was a fighter and brave never complain about pain or anything else but I new how much she was suffering, I miss her so much and I wish that soon a cure will be find for this terrible illness.